This episode continues the journey with Aphrodite, the goddess of love, and her association with healing waters. Find out how the Clean Air Act supports the health of Adirondack lakes and enjoy a yin-inspired yoga practice for the lung, kidney and urinary bladder meridians to support the flow of your internal water. Find the Facebook Shamanic Flow Circle group here. In the Shamanic Flow Podcast episode for the new Flower Moon, explore the archetypal Greek love goddess Aphrodite and endangered vaquita porpoises, plus a way to support sustainable fishing. Discover thymus tapping as a self-care practice and enjoy a 30-minute yoga practice to open your heart space and fill it with light. After a five year hiatus, I’m podcasting again. Welcome to the first episode! Listen in to explore the energy of the archetypal cat goddess Bast, big cats in the United States and the lack of those fierce felines in New York’s Adirondack mountains. Discover dance as a shamanic practice and enjoy a 30 minute yoga practice to embody cat-like sensuality through movement. I am a month into the year-long Shamanic Reiki Evolving Master Teacher program and still feeling a bit lost. I took a break from my personal Shamanic Reiki development in 2017 to focus on business. It was a valuable learning experience, although what I learned was not exactly what I had intended to when I started out a year ago. What I am discovering now, as I move back into a greater commitment to practices I had cultivated during the initial Master Teacher program, is how very important those spiritual practices are to the success of my yoga studio and what I am bringing to the community through my offerings. By the summer of 2017 I was stressed out, unmotivated, and uncreative. My father’s sudden passing in September drove me back to my spiritual side, but it was a place to hide and grieve rather than a source of inspiration and hope. I reached the end of the year in a low place, not only disconnected from my practices but beating myself up for my failure to successfully implement most of my plans and to meet my financial goals. I’ve been slowly moving back into my physical and spiritual practices, but there has been some kicking and screaming as the self-inquiries assigned as we began the Evolving Master Teacher program brought my real and perceived failures to the surface. After a month of flopping between examination and avoidance, I am back on my meditation cushion. Just a few days has made a difference, not in the circumstances of my life, but in my ability to see them without sinking into despair. During this last month of winter, while you are still called to turn inward, I invite you to consider where you stand with your own spiritual practices. Are you including those practices as part of a balanced, healthy approach to life? (If so, yay! Keep going.) Is there something that has fallen away that could be of benefit now? Please share what practices are supporting you or which you would like to begin or reignite. The waxing moon is a great time to get started, and I would love to cheer you on. What if you woke up one morning and found yourself in a different body, like Gregor Samsa in Kafka’s The Metamorphosis? That’s how perimenopause feels to me. My body is changing so quickly I don’t know the body I’m in anymore. In some ways it is like puberty, but with the frightening self-awareness of age and experience. I have been practicing yoga for more than twenty years. There have always been times when I felt like a beginner; those times were usually when I was exploring something more advanced or new to me. But now I feel like I am discovering what my body can – and cannot – do as if I have never done yoga before. At the end of the day, whether my practice was restorative or vinyasa, I feel it in my joints. Often it is my hips doing the complaining, but it might be my shoulders, or my knees. On some days it is my hands or feet. I have a hard time getting comfortable enough to go to sleep. The feeling is less satisfying than the soreness that accompanied stretching and strengthening muscles in new ways when I was first learning asanas. I feel restless and frustrated by these aches. Balance poses, like tree and half moon, used to be my favorites. I would spend hours putting together long sequences of poses, moving from one to the other while balanced on one foot. Then, one day, I started losing my balance. To practice these asanas now means falling out often, or using the wall as a prop. Those who see me in person know that I started wearing glasses everywhere two years ago. My eyes have always had difficulty working together, but now I have developed severe double vision that cannot be corrected by contact lenses. Even with my glasses, if my eyes are tired or relax too much (which never happens in a yoga class, right?) I see two of everything. Focusing on one point is especially challenging, because I’m never sure which of the things thing I’m looking at is “real,” and which is the double. I’ve been a bit grumpy about all of this, but I am finally moving towards acceptance. After all, what is my yoga practice for if not to feel deeply into my body as it is now? I am moving into new territory, and it is up to me to draw the map. That means that my practice is, again, that of a beginner. I must see what helps and what hurts. I need to discover my new edge and let go of what now takes me past it. Even with two decades of experience, I don’t have the answers. If your body is changing – due to menopause, pregnancy, injury, a joint replacement, diet – neither you nor I know how your practice needs to be. But you are welcome to join me on the wild frontier to find out through experience. During the past four weeks, I have watched seven (or maybe more – I lost track) webinars promising four ways to boost Instagram followers, a surefire method to build my Facebook group, the best method to plan next year’s revenue, … You get the picture. I was feeling the end-of-year fear. There is something about approaching December 31st on the Gregorian calendar that sends those of us with non-traditional work into a funk. I have seen even those incredible entrepreneurs to whom I have looked for guidance all year start to seemingly panic-sell their programs beginning December 1st. We don’t want to close our 2017 books in the red. I fell into the same state of fear as all those others. On top of the other challenges this year, 2017 has been financially difficult. I committed to adding and expanding a second location to my yoga studio, True North Yoga, invested in a Mastermind program, and got caught off guard on some unavoidable home and auto repairs. Summer yoga class attendance, which usually booms with visitors to our lake town, was flat. Put together, the numbers for 2017 don’t look that good. Did you know I used to be an accountant? After years of writing financial statements, I know a secret. The numbers don’t tell the real story. I’m all for eating and keeping a roof over my head (and even splurging occasionally), so I’m not belittling the importance of having sufficient income to thrive. But numbers in a spreadsheet aren’t showing the real value of the healing work I have done this year, for myself and for others. I cannot put a dollar amount on the growth and magic I have experienced. My tax return isn’t going to reflect that I uncovered a deeper truth about how I bring yoga and Shamanic Reiki into the world. It isn’t going to tally the hours I spent sitting in council with my lower world guides. It doesn’t credit the creative bursts that brought my Advanced Yoga Teacher Training modules into being. When I was trying to figure out how to pay the bills in December, I started panic-selling. I almost rushed a training that I am excited to present next year, instead of allowing the creative time to make it exactly what I envisioned. 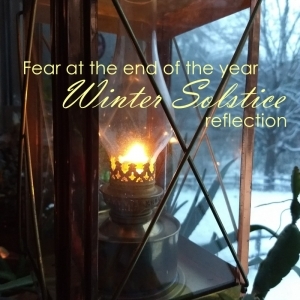 I came close to letting fear push me through the Winter Solstice without slowing down. I suspect that end-of-year fear has been around since humans were mostly agricultural. After the last harvest, the days would shorten, and the ground would freeze. There was no time to grow more. They had to get through the winter on what they had. Some years there would be plenty; other years they might run out of food. There must have been fear. And at the Winter Solstice, perhaps there was an acceptance that there was nothing else they could do except dream of spring. My family had a small, simple holiday this year. We will have further financial challenges in the new year. We will make due. No matter how your numbers are adding up for 2017, would you join me in taking long exhale to let go of the fear? Let’s instead take stock of the personal growth, the skills and talents developed, the healing that has happened and can still happen. There’s nothing more to do for now. Together, let’s let winter come. We will make it through. I’ve been following the coverage of the latest wildfires in California with a heavy heart. If you pay attention to the news, it seems like the whole world is on fire, literally and figuratively. To be alive at this time, especially for those of us who have been called to be healers, is no easy feat. There is just too much to do. But being in the flow doesn’t mean the work is easy. Every day the healing and transformative work I am drawn to do asks me to be physically, mentally, emotionally, and spiritually at the top of my game. And that’s just not possible. Like everyone else I get injured, I lose focus, I grieve, and I doubt. I can’t count how many times I was ready to quit during the past year. When I was tired and overwhelmed, I thought of pulling the plug on the whole thing. What if it’s okay to be tired? I was listening to an interview with Jo Fairly, co-founder of the organic chocolate company Green & Black, on Carrie Green’s She Means Business podcast (which is a great resource for female entrepreneurs), and Jo was asked how she did it all. Her answer was, “When you’re tired, rest, don’t quit.” Hearing that, in her lovely British accent, made me realize it was okay to acknowledge that getting tired didn’t mean I had failed, or that I couldn’t do the work. It meant I needed to rest and renew my energy. 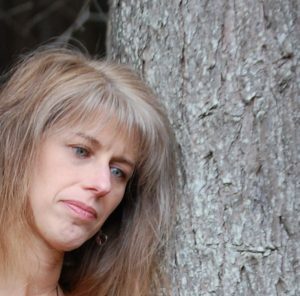 Accepting that sometimes I am going to be tired is a big shift for perfectionist Debbie. For the past few weeks, I have given myself permission to feel worn out, and to plan rest time into my day, even if it’s simply going to bed a bit earlier or treating myself to a yoga class that someone else is teaching. Then, when my energy returns, I start moving forward again. I can’t quit, because there is healing work I need to do in this world. If you are walking the path of healers and change-makers, I would love it if you give yourself permission to rest. Just don’t quit, because the world needs you to do your work. Can I witness and support your necessary desire to rest? Let me know with a reply. 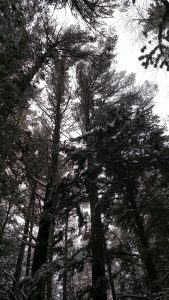 I ventured out, alone, in my snowshoes, on a quiet trail through the woods. We had had the first substantial snowfall of winter a few days before, and I came to a part of the trail that had not been broken since the storm. I’m not experienced on snowshoes and it was only my second time out this season, but it was quiet and beautiful so I decided to push on. Once my body started complaining, I stopped and turned back. It had begun to snow again, which was lovely to look at but made the trail more challenging. I caught myself getting short of breath as my heart rate came up and I took a break. There was a time when I would have been frightened out in the woods, all alone, with no cell signal, my heart pounding in my chest, but now I have a relationship with the trees. Through my shamanic work I have become aware of the life energy that flows through the trees. I have seen them “lit up” with that energy. It is the same energy that flows through you and me. Rather than panicking out in the woods, I sat in the snow with my back to a tree. I tuned into that energy. And I began to breathe with the tree. Plants and animals are the two halves of the beautiful life-sustaining oxygen cycle. Trees breathe out oxygen, we breathe it in. We breath out carbon dioxide, the trees breathe it in. Sitting against the tree, I became conscious of breathing in what the tree was releasing. It was as if I could draw the breath right out of the tree into my back. Then I breathed out and felt the tree draw in my out-breath. Back and forth, the tree and I breathed together, until my heart rate slowed and I felt safe and held. I walked calmly out of the woods. This simple but powerful practice draws my awareness to the interconnected web of life. While the woods are a wonderful place to experience it, I find the same sense of connection and peace when I breathe with the trees in my backyard or even my houseplants. I leave a small offering in gratitude for the breath when I can, and I always speak my thanks. I know I am heard.